If you already have a garage with a large unfinished attic space above it, you may have a piece of low hanging fruit in your midst, if you’re looking to find more finished living space in your home. Adding room above garage costs can vary significantly depending upon your specific situation and needs. As just hinted to, however, already having a large attic space above a garage is the least expensive way for adding a room over the garage. A few years back I planned accordingly for just such a need when I built my garage addition with a room above. I had a growing family and figured one day I might like or need an additional bedroom, bonus room or home office above the garage. Consequently, instead of just building a garage with a roof over it onto the side of my house, I thought ahead. I designed the garage in such a way that adding room above the garage would be an easy and low cost effort, which ultimately it was. Specifically, I had the front and back walls of the garage extend upwards several feet above the necessary height for just the garage level, and then added floor joists about nine feet off the finished floor height of the garage. As a result, with the effective large attic space, I created and an unfinished room above the garage. To ensure enough light for the room I also had a large dormer framed in on the back side of the garage roof and a large window on the gable end of the garage, on effectively the second floor of the garage. About a year after the garage was built, I finished the room above the garage for relatively little money. Since the walls and roof were already done, all I had to do was frame out the space, add electrical, insulation, drywall, heating, finished trim and carpeting and I had a finished room over the garage. Much of the work I did myself, thus keeping the cost of adding a room over the garage relatively reasonable. Overall for me, the cost of building a room over the garage added up to around $12K. Admittedly, the initial cost of building a larger garage was higher. I estimate it added another $10K to the cost of my garage. But when all was said and done, $22K for adding a room over the garage was very economical. If you have a garage that doesn’t have adequate attic space for putting a finished room above it, you can consider removing the garage roof and building a second floor onto it. However, this type of garage addition with room above it project is very expensive. Not only is there the cost of building the room above the garage, but there is also the costs associated with removing the old garage roof and building a new one once the new room addition has been framed above the garage. It also will make your garage unusable during the construction. Similar to what I did, when planning a new garage addition go ahead and design the garage addition with a room above it. However, instead of delaying finishing the room above it, just get it done. Overall with this scenario the cost of building a room over the garage will be the cheapest. It’s just that more money will be needed upfront to complete the project. In my particular case, I was able to save cash over the year, thus not draining my bank account when I originally built the garage. A couple of things to consider when adding a room over a garage. 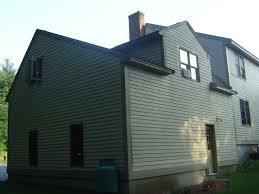 If the attic space above the garage is limited, then the installation of a dormer or two may be desired. This will increase the room over garage costs, but not by too much. You can expect to spend roughly $3K to $7K more for each window dormer added to the room above garage addition. 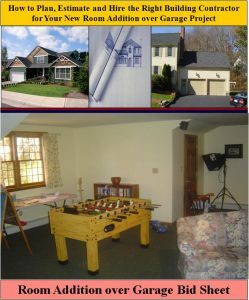 In regards to the overall cost to add a room addition over a garage, it will vary due to several factors. These factors include; the size of the garage and room addition, whether or not a room above the garage has to actually be added, rather than using the existing garage attic space, and local real estate and contractor labor rate conditions. Also, if your room addition over garage project includes a bathroom or kitchen, the costs will be significantly higher, e.g. $10K to $30K higher. Again, if the room above garage construction project involves simply finishing the garage attic space, you may be able to get away as cheaply as $15-20K. If a room actually has to be added above the garage, then the cost could be $50K or more, due mainly to the facts that (1) the garage’s roof has to be removed and replaced, and (2), new exterior walls need to be framed and sided. This latter type of room above a garage addition project also increases the complexity of the project many fold and thus will require the need for professional contractors to safely and properly build it.